Taking “resilience” out of the realm of metaphor. How do you measure resilience in cities? How would you know if your city or your community was resilient? Keren Bolter, Fort Lauderdale. Cezar Busatto, Porto Alegre. 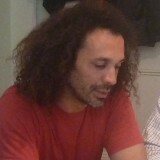 Lorenzo Chelleri, Barcelona. William Dunbar, Tokyo. Thomas Elmqvist, Stockholm. 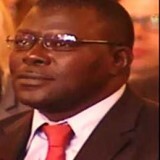 Antoine Faye, Dakar. Richard Friend, York. Lance Gunderson, Atlanta. 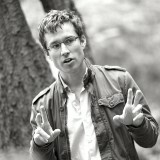 Tom Henfrey, Bristol. Patricia Holly, Barcelona and Nairobi. Dan Lewis, Barcelona and Nairobi. Rachna Leveque, London. Shuaib Lwasa, Kampala. Timon McPhearson, New York. Franco Montalto, Philadelphia and Venice. Luciana Nery, Rio de Janeiro. Henk Ovink, The Hague. Elisabeth Peyroux, Paris. Catherine Sutherland, Durban. Pakamas Thinphanga, Bangkok. Claire Weisz, New York. Daniel Zarrilli, New York. Keren Bolter, Fort Lauderdale Resilience requires two things: awareness and being in action. Be aware of what is occurring and what the risks are, and then take actions to reduce risks and increase capacity. Cezar Busatto, Porto Alegre It’s crucial to know whether a community is more or less resilient to evaluate its culture of participation and collaboration and its social cohesion and civic engagement. Lorenzo Chelleri, L’Aquila Resilience is a socio-political choice, implying trade-offs. Metrics help, but won’t save us from the development of risk-washing strategies. William Dunbar, Tokyo Resilience assessment via communities’ own perceptions, through Indicators of Resilience in Socio-ecological Production Landscapes and Seascapes. Thomas Elmqvist, Stockholm Increasing efficiency is viewed as critical for achieving sustainability, but a too strong emphasis on efficiency may erode resilience making the urban system vulnerable, through insufficient overlap in critical functions should some fail. Antoine Faye, Dakar In my understanding, if the process is aimed at fusing a “resilience” agenda with the mainstream urbanization agenda, then it should be a continuous learning process. In that sense, the concept is not a “stock” but rather a “flow”. 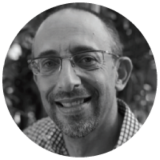 Richard Friend, Bangkok If we take resilience as being the ability to learn and reorganize in the face of changing circumstances and risks, then the need to measure resilience becomes a learning exercise. Lance Gunderson, Atlanta It is better to understand and assess resilience in urban areas, than to try and measure it for at least two reasons: difficulties in measurement due to different definitions of resilience; and attempts to measure such a property creates spurious certitude to a complex issue. Tom Henfrey, Bristol All talk of resilience these days is highly politicised, and it’s important to take this into account when considering whether and how to measure resilience in cities. Patricia Holly, Barcelona+Nairobi From the metaphorical world of ‘resilience’ writ large, is an emerging consensus around the means of addressing through concrete, reliable, and comprehensive urban engagement, the visions, aims and goals of cities to become safer, more resilient places for the people, businesses, and organizations that live there. Dan Lewis, Barcelona+Nairobi From the metaphorical world of ‘resilience’ writ large, is an emerging consensus around the means of addressing through concrete, reliable, and comprehensive urban engagement, the visions, aims and goals of cities to become safer, more resilient places for the people, businesses, and organizations that live there. Rachna Lévêque Resilience at strategic city scale requires collective governance that looks beyond the specifics to respond to intricately linked urban stresses. Shuaib Lwasa, Kampala Measuring resilience in cities is locale and context specific. Context to the risk profile and local conditions that shape the risk but also provides the levers for making cities resilient. Timon McPhearson, New York Resilience is a property of a system. Cities are systems, so on the surface it makes sense to think of building “urban resilience”. But cities are complex entities that have multiple social, ecological, and technical systems, so it’s difficult to interpret the meaning of terms like “resilient city”, let alone evaluate them. Franco Montalto, Venice Resilient cities will be as diverse in form and function as we are diverse as an urban populace. Resilience plans will morph and change as we learn and grow. Resilience solutions are local and diverse, not monolithic and standardized. Luciana Nery, San Paolo Resilience is about survival and prosperity—we need to measure it. Henk Ovink, The Hague The key question is not how to measure resilience, but how to get to resilience in an accountable and transparent way? Elisabeth Peyroux, Paris Measuring resilience should be considered both as a (very difficult) methodological and a political problem. Catherine Sutherland, Durban What needs to be measured is the entanglement of state policy and practice with the practices evident in the lives of ordinary people and how these together contribute to greater resilience. This is much harder to measure, as these entanglements emerge in multiple ways along multiple paths at different scales. 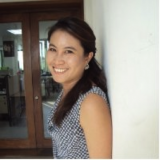 Pakamas Thinphanga, Bangkok If we take resilience as being the ability to learn and reorganize in the face of changing circumstances and risks, then the need to measure resilience becomes a learning exercise. 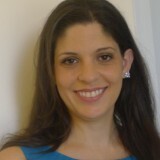 Claire Weisz, New York The value of scientific data and metrics to track losses and gains across many variables and factors could be the engine to realize the resilient communities that we are currently unable to achieve. Dan Zarrilli, New York Ready to withstand and emerge stronger from the impacts of climate change and other 21st century threats. Resilience is one of three in a trinity of key urban design values: resilience, sustainability, and livability. Yet, of the three, resilience seems to reside the most in metaphor. Many are trying to build resilient cities and communities all over the world, and “resilience” works wonderfully (for the most part*) as a metaphor. Having a “resilient city” sounds like a great idea that everyone could support. No? But to design for resilience suggests we can identify it, plan for it. There are many definitions, each addressing different sectors of thought or action: ecological resilience, economic resilience, community resilience, engineering resilience, psychological resilience, and so on. When we descend from the heights of metaphor we are quickly faced with four key questions, practical questions: resilience to what, resilience of what, resilience for whom, and decided by whom? In addition, the answers generally must be specified locally. As a metaphor, resilience is deeply susceptible to risk-washing and cynical politics. As a grounded concept, it has the potential to address serious human and ecological problems. It’s a steep challenge, community by community. Of the 21 respondents to this roundtable, some are working on direct or indirect metrics. What makes them relevant and validated? Some are measurement skeptics. If it can’t be measured then how can we construct resilience (in an adaptive management sense)? Some are actively engaged in city building and policy. How is resilience an actionable concept? In a time of gathering stresses from climate and ecological change, economic stress, and the persistent challenges of sustainability, justice and livability, resilience is a key area of thought with enormous potential. We must continue to work to bring it down from the 10,000 meters of metaphor to functional concepts on the ground. As we build and improve the cities of world, how can we act on the core ideas and promise of resilience? Dr. Bolter has planned and collaborated on several projects including the MIT Sea Level Rise Scenario Planning and Alternative Futures project and an Anglo-Floridian partnership to exchange adaptation strategies between the UK and the US. For the Southeast Florida Regional Planning Council, Keren helped create a Guide for Adaptation Action Areas, in order to identify areas that experience coastal flooding due to extreme high tides and storm surges. Resilience requires two things: awareness and being in action. Be aware of what is occurring and what the risks are, and then take actions to reduce risks and increase capacity. In a completed design for resilience, you must go beyond planning to implementation. This transition can have many obstacles, but creativity, inspiration and leadership can overcome resistance. You can measure changes in resilience by monitoring unique indicators of performance over time. Let’s move from these abstract ideas to focus on examples in my city, Fort Lauderdale, located in Broward County, Florida. 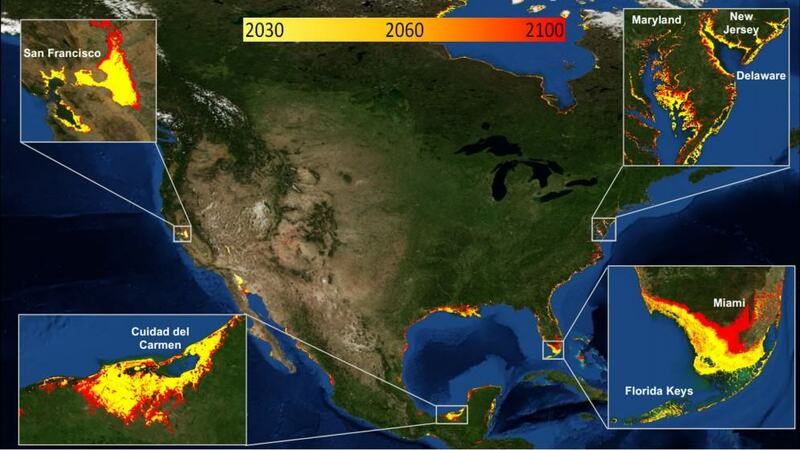 Sea level rise risks here are increasing dramatically in many dimensions, including physical, social, and economic. The Southeast Florida Regional Climate Compact has a unified projection which predicts 7-18 centimeters of sea level rise by 2030 and 17-61 centimeters by 2060. 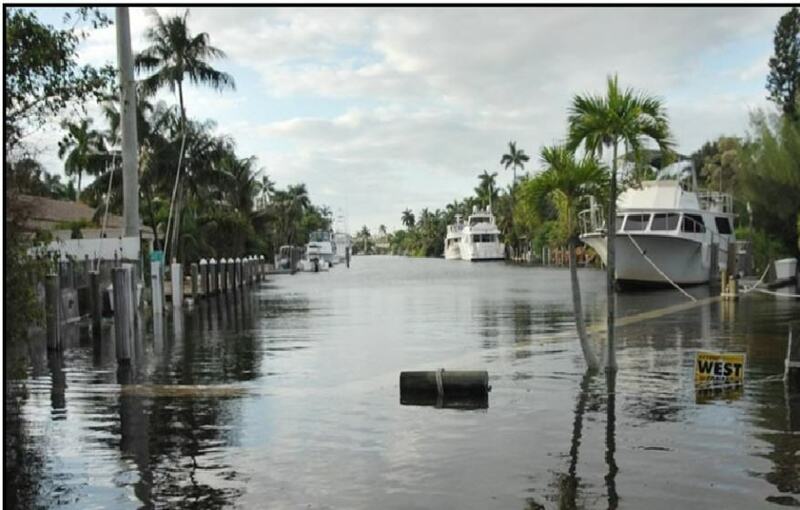 The City of Fort Lauderdale already experiences tidal flooding (see picture). With the majority of the City’s land sitting at elevations between 1.2 and 1.8 meters above sea level, there is significant risk to storm surge. In addition, the porous limestone aquifer is just a meter below the ground surface during the wet season. Increasing sea levels will continue to compromise drainage and reduce our capacity to store ground water. With these increases in flooding, water management issues will impact more people and more property due to increased growth in the city. There are a variety of health impacts from threats such as seepage from septic tanks, vector-borne diseases, and mold. Financial risks include increased insurance rates driving down property values, in turn reducing the tax base, which will limit infrastructure and drainage improvements. What about vulnerable populations, and issues such as lack of a vehicle and public transportation options during hurricane evacuations? Now that we understand the risks, how can we measure resilience? I will explore qualitatively. Adaptation to sea level rise tends to be classified in three ways: accommodate (modify structures, for example by elevating, floodproofing), protect (seawalls, living shorelines), and retreat (or at least stop developing in those high-risk areas!). Low water, Broward County, Florida. There are policy actions, design standards, and outreach strategies which can prioritize adaptation. Fort Lauderdale has been a champion in all three of these arenas. In 2011, Florida’s Community Planning Act (HB 720) was created, providing Adaptation Action Area language at the state level. Broward County was the first local government in the state adopt Adaptation Action Areas (AAAs). Last June, Fort Lauderdale integrated the language as well. AAAs are a designation in the Coastal Management Element of a local government comprehensive plan which identifies one or more areas that experience coastal flooding due to extreme high tides and storm surge, and that are vulnerable to the related impacts of rising sea levels for the purpose of prioritizing funding for infrastructure needs and adaptation planning. High water, Broward County, Florida. Leadership from the local government had driven up awareness and action, working hard to inform residents and municipal employees with education workshops and promotional materials. 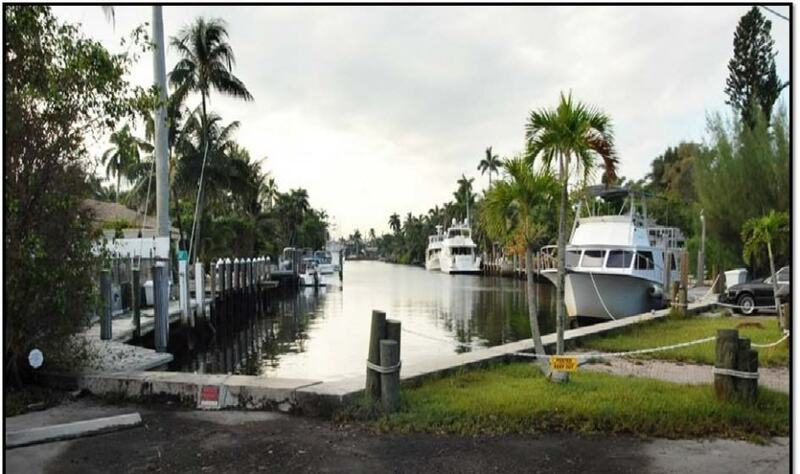 In one neighborhood, Las Olas Isles, which frequently experiences tidal flooding, drainage improvement plans include 50 tidal control valves and 48 baffles with an anticipated City budget of US$8.5 million over the next 5 years. In addition to government action, there are private businesses which are investing in awareness and action. As part of Coastal Risk Consulting, I have been helping to provide Coastal Rapid Risk Assessments which inform residents about the risks of nuisance flooding and storm surge at the parcel level over a 30-year mortgage period. These are specific examples of actions which reduce impacts which provide a foundation which we can ramp up as risks increase. 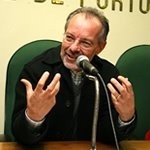 Cezar Busatto is married, father of twins, Leonardo and Carlos Ernesto, born in Veranópolis city and an Economist from the Federal University of Rio Grande do Sul (UFRGS). Resilience is a complex approach to complex problems we have not been able to deal with in our cities and societies. Therefore, I understand resilience as a new hollistic approach that tries to reconnect knowledge that has been imprisoned in silos in the last centuries. The one dimension type of solution is the origin of unsustainability. Gross National Product measuers economic growth but is not able to measure sustainable development. The United Nations made a big paradigm change introducing Human Development as a new measure of development. But it’s still short, if we consider the need to take into account the measurement of environmental, cultural, political, institutional and other dimensions of development. How to begin that paradigm change? In my opinion, we need to consider two basic concepts: territory and collaboration. Territory is where people live, grow their families and communiites, have their public spaces and social equipments. It’s the space of convivience. Collaboration is a way common people connect to each other in their informal networks on everyday life. Bringing together collaboration and territory, we begin to restablish the necessary connections of knowlwdge to create innovative approaches to solve old problems. Innovative and plural apporaches take into account different ideas and dimensions of a given situation, helping to build more complex, sustainable and resilient answers to it. We are talking about articulating multistakeholder networks getting together people from communities, private sector, government and academy to deal with real problems local communities have to face with. These person-to-person (p2p) networks are real democratic experiences of dialogue and conversation among common citizens and foster better convivience and quality of life. This is not a localist type of proposal. Local challenges are very offen connected to global ones. Let’s take a city, for instance: the challenges people face in a neighborhood are very often connected to challenges in the whole city. And it’s difficult to imagine that challenges found in a city would be disconnected from challenges at a broader scale. Besides, the p2p conversations and connections through new technologies connect local to global, bring new knoledge to the table and give more sustainable and resilient answers to local issues. Moreover, collaborative territorial networks dealing with real and everyday challenges assure people’s motivation and mobilization. To achieve this purpose, the commitment of government staff in the dynamics of these networks is also very important. That’s the social methodology we conceived in developing Porto Alegre’s resilient strategy. The core of our strategy is the articulation of local resilient networks in each of the 17 territories in which the city is divided. These networks define their main challenges and the way to face with them in a multistakeholder type of commitment. When the answer depends on public money, the local network of Participatory Budgeting is called to place a priority on the specific project in order to be included in the Public Budget. Each local resilient network will finally have an action plan to strenghten resilience in a given territory. At the same time, all these local resilience networks come together to define the main challenges for the city as a whole. In a collaborative workshop we select what we call the focal areas to make Porto Alegre more resilient. Working groups are then organized to get deeper in the diagnosis and formulation of a plan of acction for each focal area. The consolidation of the territorial and focal plans will result in the resilient plan for the city. In order to measure resilience, we will also need an innovative approach. We must of course take into account wellbeing conditions like the meeting of basic needs, public services provision and economic opportunities. But I understand it is crucial to know whether a community is more or less resilient to evaluate its culture of participation and collaboration and its development of social cohesion and civic engagement. 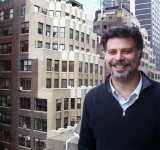 Lorenzo is the Director of the International Master Degree City Resilience Design and Management and Chair of the Urban Resilience Research Network (URNet) at the International University of Catalonia (UIC). With a background in urban and regional planning, environmental policy and urban geography, his research and teaching activities critically address the governance and planning processes related to city resilience governance. City resilience? Take resilience thinking (the theory) and apply it to cities. “Nonsense”. As an urban planner, this is what came to my mind when I first came across the definition of resilience 10 years ago. Indeed, if defined as the capacity to overcome threats, retaining system structure, functions and identity, to me this was nonsense if were to be translated to cities. Why? Because a part from Lewis Mumford teaching us that “the need for social life” and “the commodities exchange opportunities” always represented the eternal core identity and function of any metropolis, city or settlements, the real capacities of cities, evident through history as the most durable (or resilient) human artifacts, resides in their transformational capacities. Measuring city resilience? This is of course necessary and useful, and makes a lot of sense. This is not at all contradictory. The application of resilience thinking to cities, the metaphor of resilience (or “dealing with change”) has the positive effect of inspiring planners to tackle some specific urban challenges. It became worth finding measures to address resilience to disasters (recovery capacities), to climate impacts (adaptive capacities) to carbon emissions (mitigation capacities), etc. As presented from various colleagues within this roundtable, there are different valuable metrics and methods to measure such necessary and specific aspects of resilience related to urban development. However, while I do agree on the need to assess, measure, and enhance city specific resiliences, my main concern is related to the emergence of a new overall paradigm, framing resilience per se as an imperative urban goal, a label potentially fitting within business as usual development agendas and promoting resilient cities rankings thanks to its indicators and metrics. How can this be the case? We have now reached a general consensus on the need, normative compliance and positive outcomes related to resilience building. However, notwithstanding agreeing on resilience being a multifaced concept, many efforts have been spent on framing, promoting and measuring specific resiliences, while less attention has been spent in critically assessing and evaluating the trade-offs between resilience and other development goals. For instance, the “overcoming change” normative paradigm, should be operationalized through three very different approaches, namely “maintaining – adapting – transforming” (respectively aiming to build robustness, introduce incremental change or introducing long term disruptive change within the system). The three coexisting and conflictive approaches through which is possible to operationalize resilience by “overcome change”. Credits: adapted from Chelleri et al (2015) “Resilience trade-offs: addressing multiple scales and temporal aspects of urban resilience”, Environment and Urbanization (27)-1: 181-198. These coexisting but conflictive approaches, which could be operationalized through hundreds of different actions building resilience, can imply specific or strategic trade-offs. For instance, how would one frame long term transformational resilience synergies with enhancing the robustness and business continuity of current critical infrastructures? How to build resilience through community led initiatives (enhancing local self-sufficiency) in synergy with the need of growing the international competitiveness of a city? The main issue is that resilience, as sustainability, should be a social and political choice, about how and which substantial change, or incremental change, or asset to be maintained through robustness, promote. Green-washing experiences are a warning of the potential manipulation of metaphorically positive concepts, like sustainability. While our unsustainable urbanization process takes place, we should carefully avoid the rise of Risk-washing development strategies, manipulating the normative message of resilience building. The assumption of the normativity of resilience hides the issue of who is building it, for whom, and possibly replacing urban sustainability outcomes with urban (un-sustainable) durability. Within the academic debate, it is clear to us that resilience is not just the flipside of vulnerability, and that in cities these three approaches related to resilience building (figure above) should coexist within the emerging urban resilience thinking. However, on the ground, resilience and its metrics, do not provide practitioners with any guide on how to prioritize or manage the process of building development pathways accounting possible resilience trade-offs. For instance, if we take resilience metrics and assess both the renewable energy distributed network of a very sustainable community, and the redundancy and modularity of a decentralized fossil fuel energy network, owned from a big company, they could eventually score the same level of resilience, in providing a reliable energy service. But what about their embedded trade-offs respect to sustainability, or social justice, or economic implications of such resilience metrics? As Aristotle said, the whole is greater than the sum of its parts. For urban resilience I think we should learn and frame our thinking following this quote. Urban resilience is not just the sum of its parts. Measuring its social, economic, infrastructures or disaster facets performance is key. It is key only once we are clear on the city overall goals (like achieving sustainability, or inclusiveness, enhancing people quality of life, etc.) in order to frame how each of the resilience facets could support or impede the path to achieve them. 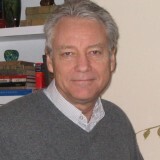 William Dunbar is Communications Coordinator for the International Satoyama Initiative project at the United Nations University Institute for the Advanced Study of Sustainability (UNU-IAS) in Tokyo, Japan. “Resilience” has gained increasing attention in recent years, to the extent that it seems to be rivaling “sustainability” as the word of the day in many fields. This makes it increasingly important to study resilience systematically; otherwise there is a risk of the term becoming overused and therefore essentially meaningless. Effectively measuring resilience is one step toward systematic study, keeping in mind that the goal is not just to study resilience but to optimize it. Defining a community’s resilience loosely as its ability to withstand various types of changes, shocks and disturbances, unfortunately the only way to directly measure resilience is to subject a community to shocks and disturbances and see if it withstands them, which is obviously not practical. So we are left with estimating or measuring indirectly. One way to do this is by using elements that are thought to contribute to resilience and can be measured directly as indicators. Ideally, it would be possible to use these to produce hard, quantitative data that could then be used in some sort of universal index of resilience. The fact that different communities exist in different ecological and cultural contexts, however, means that various responses to related challenges may contribute to or undermine resilience differently in different places. This can make it difficult if not impossible to identify and correctly weight quantitative elements of resilience. An alternative approach is to rely on qualitative, perception-based data. This roundtable entry presents an example of the latter approach. The “Indicators of Resilience in Socio-ecological Production Landscapes and Seascapes (SEPLS)” were developed through a collaborative activity carried out under the International Partnership for the Satoyama Initative (IPSI) by Bioversity International and the United Nations University Institute for the Advanced Study of Sustainability (UNU-IAS). After extensive field-testing around the world, they were further refined and updated in a Toolkit publication in collaboration with UNDP and the Institute for Global Environmental Strategies (IGES), providing guidance on how to apply the indicators. Much of the indicators framework applies to peri-urban areas, particularly where a significant amount of food production takes place. As was pointed out in a recent TNOC essay, peri-urban areas can provide connections between people living in urban areas and rural areas and can see benefits in resilience through effective management. Perhaps more important than the numerical scoring of the indicators is the process of having the community gather to discuss their resilience. Many participants have never considered resilience as a concept before, and it can be eye-opening for them to think about how different kinds of resource management in their landscape affect the community’s prospects. This can then feed into a long-term process of holistic resource management including repeated assessments and actions based on their results. There are trade-offs involved in measuring resilience with either a purely quantitative approach or a qualitative, perception-based approach like the one introduced here. The former may provide the sort of comparable numerical data preferred for making decisions about resource allocation, but that same data may be less useful to those on the ground in any landscape. The latter, on the other hand, may not provide comparable data, but may pay off in secondary benefits like improved communication, understanding and motivation to work toward a resilient community. Measuring resilience is a problematic but extremely important issue for urban as well as other communities, and I hope the Indicators of Resilience in Socio-ecological Production Landscapes and Seascapes (SEPLS) will help forward the process. I encourage readers to download the Toolkit publication, and I would like to thank TNOC for the opportunity to take part in this roundtable and discuss these issues. To start out, I will make two statements about resilience. Firstly, my view is that resilience represents a systems approach (non-normative) to meet the challenges of sustainable development (normative goal). So at the outset, resilience could be either good or bad depending on the context. We certainly struggle with undesired resilience (e.g. dictatorships and corruption are examples of systems often being resilient but undesired by most). Secondly, resilience is a property of a system not of a locality. There are many instances where resilience has been linked to particular city or small geographic region. But this may lead to many unintended consequences, for example, building (desired) resilience in one city may lead to erosion of resilience or create undesired resilience elsewhere. Only if we view resilience as being a non-normative systems approach where cities are viewed as open systems connected to the rest of the world in many ways, may we be able to design appropriate indicators of urban resilience and measure some of its components. Although we are still far from identifying such measures I will suggest two areas where we should start developing these, admitting the large challenge we have ahead of making any such measure operational. The first starts out from the common view that increasing efficiency in urban functions (transport, energy, governance) is critical for achieving sustainability. However, in some instances a too strong emphasis on efficiency (maximizing outputs) can erode resilience through a deliberate reduction in redundancy and connectivity. 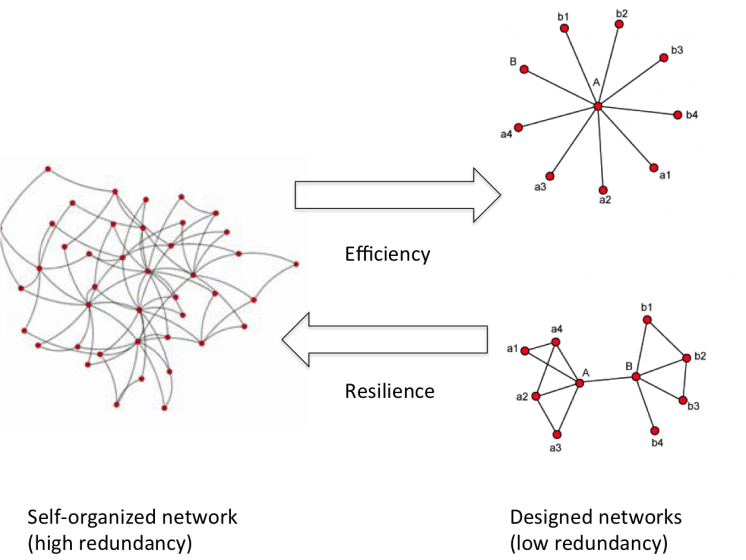 The loss of redundancy and connectivity might create vulnerabilities in the urban system as a result of an increased dependence on a few sources and the entire system might become unstable having insufficient overlap in functions. In the figure below there is an evident difference between a self-organized system/network (to the left), having high redundancy in connections between different parts (many alternative pathways if one fails) and designed systems/networks (to the right). There is empirical and theoretical evidence for that the trade-off between efficiency and resilience is real, and thus it would be worthwhile developing a measure of redundancy or degree of overlap for critical urban functions to avoid loosing desired redundancy. Such a measure could for example be based on some rather simple metrics developed in network theory. Secondly, to build resilience, urban regions must take increased responsibility for and take into account their profound connections with, and impacts on, the rest of the planet. Collaboration across a global system of cities could and should provide a new framework to sustainably manage resource chains. Here a measure is needed that capture the intensity and type of such collaborations across multiple scales. 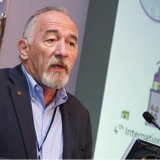 So combined, such measures could provide us with guidance for where and how much we should invest in redundancy in urban functions and in governance and institutions and for engaging in collaboration across a global system of cities. The outcome would likely also help us understand some of the true costs of sustainability. However, it is still uncertain if we will succeed in finding such measures that truly could become operational and used in urban regions across the world. Perhaps we may alternatively view resilience as a concept that brings new dimensions and insight into urban planning. Insights from resilience thinking provide urban planning with a new language and metaphors for the dynamics of change and new tools and methods for analysis and synthesis. Most importantly, a resilience approach confronts modes of governance based on assumptions of predictability and controllability with a mode based on dynamics and non-linearity. However, resilience thinking provides planning with little guidance in prioritizing or addressing tradeoffs between different development strategies, highlighting the inherently political character of urban governance. Perhaps these insights from resilience thinking into urban planning combined with the acknowledgement of the limitations of these in addressing trade-offs, e.g. among different groups of people, is perhaps still the important contribution resilience can make to a sustainable urban and socially equitable future. 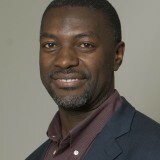 Antoine is the Chief Resilience Officer (CRO) of the city of Dakar in Senegal, West Africa, where he oversees the elaboration of a Dakar Resilience Strategy. The idea of “resilience” is gaining ground in urban policy circles. Although differently defined, the concept is commonly accepted as being the process from which, cities as complexes systems “of individuals, communities, institutions and businesses”, would be able to gain “the capacity to survive, adapt, and grow no matter what kinds of chronic stresses and acute shocks they experience” (100 RC of the Rockefeller Foundation). On one hand, provided that above definition hold true and is widely shared, we will at least success in taking “resilience” out of the realm of metaphor and avoid that every actor gives a meaning to the concept depending on the trajectory that that actor wants to adopt. On the other hand, in my personal understanding, if the process is aimed at fusing a “resilience” agenda with the mainstream urbanization agenda, then it should be a continuous learning process. In that sense, the concept is not a “stock” but rather a “flow”. Legitimately, the question of “how do you measure resilience in cities? How would you know if your city or your community was resilient?” makes sense only if we encompass that “resilience” is not acquired, but rather sought. Indeed, the commitment towards resilience is accompanied with challenges that open to opportunities. Both, perspectives depend on various factors. These factors can ease or deepen the challenges while maximizing or annihilating the opportunities. For instance, in Africa, the present context of that of rapidly growing cities has produced two key figures, namely; informality and entrenched inequality. A prerequisite for building resilience in this part of the world is to understand how informality and entrenched poverty interact and are intertwined. We are not without knowing that informality manifests itself with settlement on unplanned land without public services and bulk infrastructures, unregistered and or transfers of constructions, insecure job, unregulated trade and service provision; all of such widening the already existing inequality between the “have” and the “have not” and deepening the vulnerability of the later to resist to shocks and stresses. However, above all that precedes, what born out of informality is perhaps the inability for the institutional (systems) of the city to capture data from these constituents in order to build a base line to inform the prerequisite status with which to depart from in elaborating a resilience strategy. Thus, the most difficult aspect of building resilience in city like Dakar in Senegal is the unavailability of reliable data to form solid hypothesis and assumptions based on reliable indicators. In such case, “measuring resilience to know if your city or your community was resilient” will be just hazardous since there are no indicators to assess the real impacts of policies and infrastructure investments. According to the World Council on Cities Data (WCCD), cities are subject to complex dynamics forcing us to dwell upon a necessary framework if we are to understand the interaction of natural and human system within that specific space. In that view, the WCCD adds that the resilience of cities to withstand the impacts of natural and social evolution and changes depends predominantly on the flow and efficient management of resources. I sense that better indicators can enable us to better measure the resources flows and interactions towards holding governments and communities accountable to their targets and goals which is the ultimate objective of resilience. 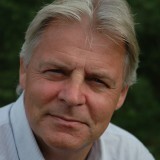 Richard Friend is in the Environment Department, University of York, and member of the management group of the University’s International Development Network. If we take resilience as being the ability to learn and reorganize in the face of changing circumstances and risks, then the need to measure resilience becomes a learning exercise. Given the nature of urbanization as a deeply contested process of change entwined with issues of power, knowledge and rights, promoting such learning around measurements of resilience becomes a process of social learning and dialogue. Yet it also needs to be a process that can accommodate different values and interests in ways that allow for innovation, and ideally, for socially just and ecologically viable outcomes. The major challenge has been in getting issues of climate change and resilience on the policy agenda. Measurement of urban resilience requires consideration of these three elements and the ways in which they interact. We have experimented with different approaches to measuring resilience; the jury is still out on which approaches work best but certainly different approaches serve different ends. From our perspective from city level engagement in Thailand and Vietnam, we have had greatest success adopting self-assessment methods. For example, the UNISDR Local Government Self Assessment Tool (LGSAT) is based around the Hyogo Framework for Action key essentials, providing a kind of global standard. It is framed largely around disaster risk reduction rather than climate change, although elements of climate resilience do appear in some of the questions. These generally have to separated out into two discussion points—for example, assessment around disaster risk reduction in many circumstances is far more positive than around climate resilience. The questions in the LGSAT are efforts at defining key elements of resilience. This is also requires further refinement around characteristics of resilience which we have taken as being—diversity, flexibility, redundancy, safe failure, access to information and participation in decision-making. By adapting this framework, and focusing in on core elements or urban resilience around governance, institutional coordination, land use planning etc.—we have been able to facilitate dialogue among state and non-state actors that has identified key areas of weakness (and in rare cases strengths! ), and also the very different, conflicting perspectives of different actors. In this way we are able to open up for public debate, issues around resilience of what, for whom – and critically, who defines ‘resilience’. The focus of this effort has been less concerned with the score and more with the dialogue. Even so, the record of the dialogue becomes a point of reference for city stakeholders to monitor progress in improving resilience. However the challenge still remains in actually achieving degrees of urban resilience that are also socially just. Pakamas has a technical background in biological sciences and coastal ecology with a Ph.D. from James Cook University, Australia and a bachelor’s degree from the University of Oxford. 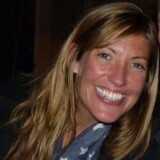 She joined TEI in late 2008. I think it is better to understand and assess resilience in urban areas, than to try and measure this property for at least two reasons. These reasons include 1) difficulties in measurement due to different definitions of resilience, 2) and that by attempting to measure such a property creates spurious certitude to a complex issue. The word resilience has been defined and applied in at least three different ways by different scholars or scholarly fields. Such different definitions imply not only different metrics and approaches to measurement, but also the feasibility of measurement. One definition, used by physical scientists and engineers is referred to as engineering resilience. For such systems, there is an assumption of a single configuration (regime, state or identity) and resilience is defined as the magnitude of a disturbance and the capacity of the system to recover from that disturbance. For the engineering type of resilience a variety of quantitative metrics have been proposed which relate to the rate at which the system recovers to a pre-disturbance state. Such metrics may be a recovery of processes or structures, such as restoration of power outages, or rebuilding buildings. Even with this type of resilience, there seems to be little agreement on which of the many attributes should be measured in practice. Another type of resilience is called ecological resilience. Ecological resilience refers to the shifts in controlling variables that mediate or control the transition from one state or regime to another regime. Moreover, the variables that influence such shifts generally operate at different scales of space and time. Because of the dynamic nature of these thresholds, and difficulties in measuring such slow and fast dynamics, this type of resilience may be assessed, but is (for all intents and purposes) not quantifiable or measureable. The third type of resilience has been described as community resilience. Some social scientists reject the notion or existence of social systems and hence community resilience. For those who do recognize community resilience, it can be characterized as the capacity of a group or organization to function with respect to specific disturbances or crises. Due to the novelty of configurations, ranges of functions, a large and complex number of variables that define a community’s capacity to respond to a specific disturbance, such resilience is also (for all intents and purposes), not computable or measureable. 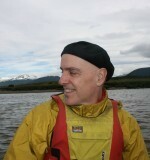 Tom Henfrey is a researcher, educator, activist and social entrepreneur on community action for resilience and sustainability based in Bristol, UK. All talk of resilience these days is highly politicised, and it’s important to take this into account when considering whether and how to measure resilience in cities. Most treatments of urban resilience are overtly or covertly complicit with the appropriation of the concept by conservative forces seeking to reinforce inequalities of wealth and power. The essence of this neoliberal discourse is to conflate resilience with persistence, as an outcome whose necessity needs no qualification. Urban resilience, therefore, is presented as the ongoing existence of cities in something like their present form: nonwithstanding either its desirability or wider consequences. Although ill-informed and inchoate—for reasons I’ll explain shortly—this narrative is implicit in almost all mainstream discourse on resilience. It is abetted by an ingenuous and academically fashionable postmodern notion that resilience is not a well-defined quality of complex systems, but a purely normative concept that can and does mean all things to all people. Created and sustained largely by social scientists lacking any familiarity with relevant scientific theory—and often any apparent notion that the possibility that such theory exists—this notion is blind to, among many other things, the effects of power relations on the dynamics of social systems. Resilience is neither the mere fact of persistence; nor does the latter reliably imply the former. Resilience is a quality: a capacity to negotiate change through creative responses, including the prospect of transformation to a radically different form when conditions demand. In their current form, cities inherently lack resilience. They depend on throughputs of matter and energy that are utterly unsustainable, and consequently endure only because they externalise the consequent social and ecological damage: in other words by systematically undermining resilience elsewhere. Their primary function—reflecting the main, unstated, policy goal of almost every government in the world—is to ensure that wealth and power accrue disproportionately to those who already have both in excess, at everyone else’s expense. An inevitable consequence of increasing inequity is to intensify resource flows to even less sustainable levels, further undermining resilience in the city itself, its constituent subsystems, and connected systems elsewhere. All centralised initiatives on ‘resilience’ of which I am aware are actually concerned with perpetuating this state of affairs. For this reason, no city in existence can plausibly claim to be resilient. Nor, limited by present conditions and mindsets, do we have any solid idea what a resilient city would look like. There are some inspiring visions, and some good ideas of how to get there, but little prospect of progress under present urban governance and planning regimes. Each disruption experienced by a city is a signal of its fundamental lack of resilience, and hence an opportunity to identify routes towards transformative change. Urban resilience strategies that emphasise maintaining the status quo ignore these signals and dismiss these opportunities. In doing so, they force change in exactly the wrong direction. Where such strategies form the basis of measurement, the results will be useless at best, and more likely counterproductive. Resilience theory shows that, in ecological systems at least, when resilience changes it does so abruptly and without warning. The indicators that a system is approaching such a threshold bear no predictable relationship to the changes that take place when it is reached, and are evident only in retrospect, if at all. Rather than seeking to measure either progress to resilience or resilience itself, what in my view is needed is a more qualitative approach to fostering the conditions that can enable such a transformation. This requires political commitment to dismantle existing political, economic and financial institutions, and support for meaningful efforts (pretty much all by grassroots actors too marginal with respect to these institutions to have vested interests in their perpetuation) to replace them with flexible and adaptive structures able to transform in whatever way necessary to allow resilience. Only then can begin the work of building genuinely resilient cities and societies—that sustain themselves, grow and flourish in ways that allow interdependent social-ecological systems to do the same. 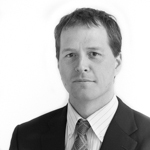 As a civil engineer and private consultant, Dan Lewis has worked in urban reconstruction and housing programmes in South Africa and Chile as well as with First Nations communities in his home region on Vancouver Island, Canada since 1987. The journey from concept to concrete is observable in the dozens, maybe hundreds of resilience-based dialogues currently underway. Everything from food security to kinder-garden care; ‘community’ to global; climate change to criminality; and metrics to ‘zeitgeist’ are being explored, debated, calculated, and sometimes even acted upon. Perhaps this is the foundation of the metaphor—resilience described by chaotic, disjointed, soup-to-nuts type interests. Sifting through the varia however, is non-ending, often incredibly interesting, and virtually impossible to isolate the gems within the limitations of time and growing demand for understandable, reliable, and strategic action. Nowhere is the pressure more acute than from the cities and towns throughout the world asking for guidance and seeking support to introduce new planning, development, and management paradigms that (ultimately) result in better capacity to withstand the shocks and stresses they face daily. Our journey within UN Habitat’s urban resilience programming begins from this point. Key words shaping the approach include: ‘cities and towns – understandable, reliable, strategic – planning, development and management – and action’. In the best case, the manner in which cities—all cities—change, is through the functions of planning, development and management. These functions, when they are undertaken in a strategic, reliable and understandable manner can positively re-shape cities over time. The implications are huge however. Planning in the 21st century hasn’t changed since the beginning of the 20th century, and the inertia is enormous. Development patterns, driven by grossly unsustainable, real-estate driven, land use, has produced urban sprawl (and trillions in profits…and losses) that will take decades to undo. Urban management practice continues in the silo’d bureaucratic models that seem timeless and ubiquitous. In spite of this; that there is demand for creating more resilient cities and towns, is indicative—not conclusive—of a desire for change, and gives us the first milestone in the journey from metaphorical to literal. The challenge now begins to take shape—introducing comprehensible, reliable and strategic action through urban planning, development and management to achieve—over time—better resilience to both acute and longer term shocks and stresses. Breaking down these key words or ‘elements’ was essential to getting from concept to concrete, and finding a comprehensive approach to meeting the challenge. It began simply with the who, what, where, when and how interrogation which rapidly blossomed into a pretty complex array of interdependent, multi-stakeholder, multi-sector, multi-hazard ingredients in the mix. However, even this helps move the journey forward. Accepting, for example, that an urban ‘planning’ process must be ‘comprehensible’ we understand implicitly that this means different things to different people—in other words, it demands ‘reliable’ translation giving meaning to all stakeholders from politicians to bankers, community members to utility operators, and so on. The same applies to urban ‘development’ and ‘management’ processes, and we have access to methodologies for consultation, collaboration and engagement that are well developed and tested throughout the world. Introducing new content—knowledge and process that delivers elements of resilient urban development—and strategically re-orients how a city or town develops, benefits from these tools and ensures that all stakeholders contribute, own and support both short, and long term aims. Similarly, understanding that cities are incredibly complex, complicated, dynamic and unique systems; creating understandable and reliable baselines from which to plan, develop and manage within a resilience-based strategy, requires layered communication that provides meaning to that same diverse group of stakeholders. Moreover, developing an approach that is applicable in all cities and towns demands standardizing both the urban systems model, and the language and meaning of resilience-based planning, development and management. Why? Try and find out how many cities there are in the world today. Wikipedia ridiculously defines 85, most of them in China. Other sources range from 4,000 to 3 million cities and towns…bottom line is no one knows. In any case, far too many to suggest a customized process for each, which achieves little in terms of building understanding, or standardizing reliability, or achieving greater, global strategic aims of meeting demand for more resilient cities and towns. Now we’re getting somewhere—we have a clear challenge, we understand the means to meet that challenge, and are well on our way developing the models, metrics, standards, and systems through which to deliver. We’re not alone—organizations participating in the Medellin Collaboration on Urban Resilience for example represent the largest community of practice engaging with cities, and have agreed to a set of common aims to meet increasing demand. Resources, both knowledge-based, and knowledge generating, are emerging from academia, and analysis of implementation, and political commitment at all scales is freeing up financial support directly for cities, and for the support institutions they rely on. From the metaphorical world of ‘resilience’ writ large, is an emerging consensus around the means of addressing through concrete, reliable, and comprehensive urban engagement, the visions, aims and goals of cities to become safer, more resilient places for the people, businesses, and organizations that live there. Patricia Holly Purcell, a US and British National, is the Senior Strategic Partnerships Advisor at the United Nations Human Settlements Programme (UN-Habitat), based in their Nairobi Headquarters, focusing on the Agency’s City Resilience Profiling Programme. 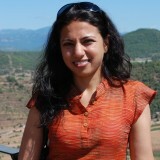 Rachna Lévêque is an urban and regional planner with global experience on projects ranging from buildings and public space to strategic city planning and policy making. The dominant approach to resilience in cities takes the approach of specific resilience – by focussing, for example, on resilience to disasters (natural or manmade) and resilience of communities. This approach, of building resilience of this to that and under these circumstances, enables resilience to be measured to some extent and therefore operationalized. However, focussing on specific resilience risks losing the overview of the entire city as an intricately connected social-ecological system (our economic systems being a subset of the ‘social’ of the social-ecological system). Hence, it raises questions like: who decides whether the resilience of one community is at the expense of another? Decision makers taking a long-term strategic perspective of the city often have to judge various priorities against one another and pave a way forward, often in an environment of changing social, political, environmental, economic and technological influences locally and globally. Hence, their occupation is predominantly with generic resilience. In this respect, it is more meaningful to think of resilience as the ability of diverse stakeholders to collectively influence their social-ecological system (or sub-system) to be in a state of (desirable) resilience. In terms of city-level decision-making, this relates to three things: the ability of stakeholders to get involved (or connect into wider system dynamics), the ability of stakeholders to have or gain knowledge of the system, and the ability of stakeholders to take meaningful action (i.e., to have influence). The debates on power and the politics of inclusion and exclusion are interweaved through each of these: who is involved in what, why and in what way; which stakeholders have what access to the various discussions that take place at strategic level; what opportunities do stakeholders have to find common solutions; what opportunities do they have to question and present new ideas, and what potential do the stakeholders’ propositions have to ‘revolt’ to strategic decision making levels. It is important to remember that stakeholders comprise not just resident communities, but also workers, businesses, developers, utility providers, and various governmental and non-governmental authorities and agencies including those operating at regional and national level. Based on the above, it seems obvious that greater transparency and participation in decision-making would lead to (desired) resilience. However, at city-regional level one has to consider whether the mechanisms for transparency and participation actually allow diverse stakeholders to have influence while also allowing the city to decide how to move forward. To take a recent example, in Mumbai, the draft Development Plan developed after three years of participatory workshops and consultations was recently scrapped by the state government in the wake of citizen protests. Is this the ability of citizen groups to have influence? Perhaps. Is it the exercise of veto by the state government? Yes. Is it a desirable state of resilience for the city? For some communities negatively influenced by the Development Plan, it provides another window of opportunity, however slight. However, for the city as a whole, spending further time and effort on a Development Plan which will probably have little influence on what actually gets built in the city is quite meaningless in the absence of other systems which support transparency and public participation. Not being able to have a say over its own development trajectory probably does not equate to a desirable state of resilience either. Nonetheless, Mumbai perhaps needs to consider whether its diverse needs (needs of its diverse communities and needs of the city region) are reconcilable at city scale in a document such as the Development Plan, and make provision for more local and regional initiatives which will incorporate its specific and dynamic needs. The dangers for urban resilience at strategic city scale are likely to be different in different contexts. In a city with well-established systems of reporting and mechanisms for participation, involving the same stakeholders who get involved every time conserves knowledge of the system but could lead to a diminishing set of ideas and experiments to learn from. It is also easy to follow the protocol in any public consultation without actually taking on board the issues raised. The regular mechanisms of information transfer (websites) often exclude the most vulnerable, excluding their needs and points of view in the direction that the city takes; this frequently places the burden of resilience on NGO’s to transmit the information, collate input and present ideas in a convincing manner. Of course, actually implementing anything that is proposed requires both political will and capability, and may require collaboration and cooperation between agencies at different scales and with different priorities. I therefore see resilience for the whole city not as an issue of robust infrastructure or community coping strategies, but as one of good collective governance that allows diverse stakeholders from multiple scales to come together, interact and share ideas in a fairly power-balanced manner, and find common ground on a variety of issues in a way that allows the city to move forward. This might mean ‘agreeing to disagree’ on certain issues and agreeing to experiment on other issues with a view to learning for the future. However, governance for resilience requires more than collaborative dialogue, it requires stakeholders to move their focus from specific sectors, scales or interests, to the interlinkages in the complex social-ecological system that are our cities. As the debate on the Sustainable Development Goals by UN member countries reaches its final lap for approval, there is general consensus about the transition from development at as measurable progress in terms of economic growth, improved social services, employment and incomes, trade and human wellbeing to development that encompasses nature, resource use in consideration of the planetary boundaries. The most daunting of legs in achievement of sustainable development is the implementation of actions for the proposed 17 Goals and 168 targets. The debate about sustainable development is yet to reach consensus on how to achieve these goals and targets and how to measure progress. Parallel but very closely related debates have been going on in regard to climate change and disaster risk reduction. These three global debates are yet to resolve the challenge of making resilience an actionable concept and therefore measurable to address the inherently constructed, cumulative and extensive risk in various contexts. This calls for alternative conceptual frameworks, methodologies, data and tools to measure progress in achieving sustainable development goals. Whereas the debates are global, the challenges are also local and these three issues of sustainable development, climate change and disaster risk reduction form the grand challenges of the century. This is because sustainable development is likely to be undermined by increasing risk and disasters, and or, progress so far made in terms of development will most likely be reversed by the increasing disasters. With intensive disasters notwithstanding, the case for extensive risk and associated disasters is a risk profile for much of Africa and particularly Urban Africa. 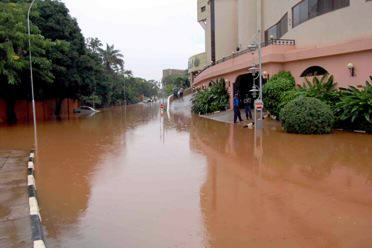 Kampala flood. Photo: Shuaib Lwasa. Amidst closing the urban infrastructure deficit, sustaining the economic growth while reducing or avoiding emissions and adapting to a changing climate, cities in Africa present diverse risk profiles that define the city resilience challenge. In my opinion, climate risk and other risks, form the cornerstones of defining and achieving resilience in cities of Africa. Achieving resilience in cities of Africa will most likely occur through three ways: first, the understanding of current risk rooted in historically constructed risk such that recovery from unavoidable disasters minimizes loss and damage; secondly, that future risk is anticipated and strategies implemented to reduce, the creation of new risk, potential loss and damage; thirdly, that current and future risk would have to be addressed in context of reduced impact on livelihoods and wellbeing in cities to enable building back better that reduces creation of new risk. There are synergies and tough choices to make in building resilient cities. These tough choices are potentially the basis for measuring resilient cities, which is a difficult issue to achieve. Measuring resilience in cities is locale and context specific. Context to the risk profile and local conditions that shape the risk but also provides the levers for making cities resilient. With cities taking climate change adaptation seriously, building resilience in cities to effects of climate change and other urban challenges has become an increasing priority among urban policymakers, planners, designers, and managers. 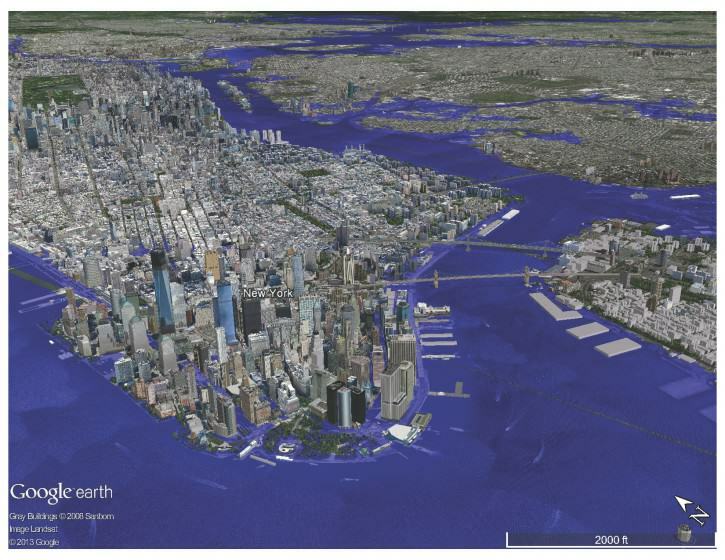 Coastal cities facing severe sea level rise, for example, are learning to “live with water” and thus build resilience to flooding into multiple aspects of planning and development. Resilience is a property of a system. Cities are systems, so on the surface it makes sense to think of building “urban resilience”, or designing “resilient cities”. However, cities are complex entities (McHale et al. 2015) that have multiple social, ecological, and technical systems (SETS), which interrelate and feedback on each other, making it difficult to interpret the meaning of terms like “resilient city” or “urban resilience” that apply to the city scale, let alone evaluate them. Additionally, resilience is a multidisciplinary concept that encompasses persistence, recovery, and the adaptive and transformative capacities of urban systems and their subsystems (McPhearson et al. 2015). Improving resilience at both small and large system scales depends on answering the question of resilience “of what, to what” and, perhaps especially in urban areas, resilience “for whom”. It also means recognizing that resilience at one scale may positively or negatively impact resilience at larger scales. 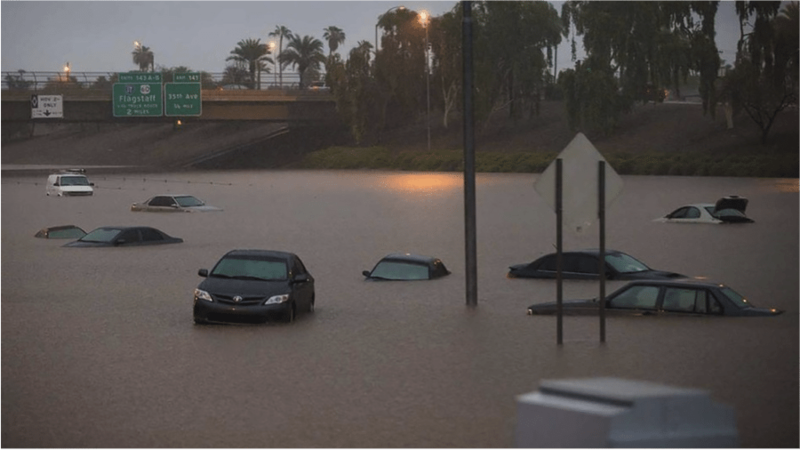 Additionally, resilience to flooding in one part of the city, for example, may have no, little, or a large impact on resilience in another part of the city. Despite the need to think in systems to deal with the very real equity, livability, and climate change challenges we face, defining, measuring, and evaluating resilience in the urban context means, for the moment anyway, breaking apart our complex urban systems into their parts. What I mean is this: We can develop metrics and indicators to evaluate social resilience, ecological resilience, and technical/built infrastructure resilience for particular challenges in a particular location, but we don’t have robust methods for evaluating resilience of a complex multi-scale system like a city. Even evaluating resilience in the social, ecological, or technical domains is not a simple task, but it is certainly doable. Engineers and product designers have been doing this for a long time and can provide reasonable methods and metrics for evaluating the resilience of a building, or bridge, or energy supply system to particular risks, such as flooding, storms surge, high winds, or power outages. Though we still have a long way to go, we can develop these kinds of metrics for evaluating social resilience as well. Take heat waves as an example. 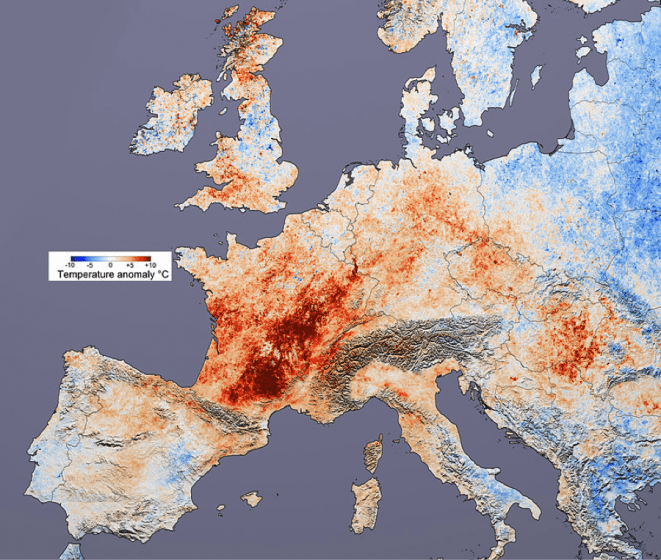 Following both the Chicago heat wave in 1995 and the European heat wave in 2003, analyses found in both cases that people who were better connected socially were less prone to heat-related death (Klinenberg 2003). We can learn a lot by comparing how disasters differentially affect different communities. Developing indicators for social connectedness, social cohesion and other potential indicators for social resilience must become an area of active research, especially since cities are already asking for these indicators in urban planning and policymaking. Built and technological infrastructure may even be developed as potential social resilience indicators in so much as they may tend to increase or decrease the potential for social cohesion and other attributes of local communities that allow them to be more or less resilient. Developing methods for assessing ecological resilience is already an active area of research with good progress developing indicators to various ecological stressors and pressures. For example, ecologists can utilize biodiversity data combined with species trait data to develop functional response indicators. The assumption, backed up by research (though primarily in rural contexts), is that if species in an ecological community have a high diversity of traits that can respond to stress, disturbance, pollution, or other ecological challenges, then they are more likely to be resilient than a community with a lower diversity of response traits. Additionally, the importance of redundancy to resilience is important to keep in mind since communities with many species that have a particular trait useful for dealing with stress will fare better than communities that may have only one or few species with that particular trait. Though these kinds of ecological resilience indicators are beginning to be developed, we have yet to test this approach for multiple taxa and in multiple urban contexts. The resilience research community has much left to do to not only better develop the various indicators for resilience in the social, ecological, and technical domains of our urban systems, since this remains all very new, but also to learn from each other in the process. For example, research approaches in ecology could inform development of social resilience indicators, and visa versa. The goal should be that the rise of resilience will serve to develop a broader understanding of the systems nature of planning, governing, and design while also driving greater interdisciplinary approaches and scholarship to foster the cities we want. Klinenberg, Erik. 2003. Heat Wave: A Social Autopsy of Disaster in Chicago. University of Chicago Press. 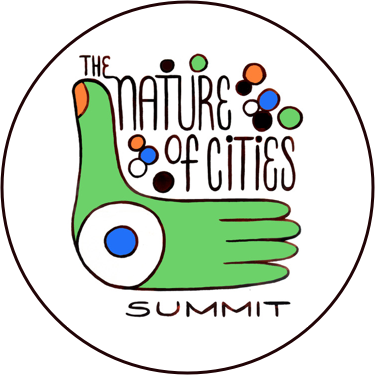 Not unlike natural ecosystems, cities provide us with a wide range of functions and services. In the words of Harris and Ullman (1945) they are “…focal points in the occupation and utilization of the earth by man. Both a product of and an influence on surrounding regions, they develop in definite patterns in response to economic and social needs.” Cities are housing; they host new economic opportunities; they promote social interaction and cultural advancement. Cities free up a certain fraction of the human population from having to work the land directly, critical since according to Jane Jacobs (1970) “agriculture is not even tolerably productive unless it incorporates many goods and services produced in cities or transplanted from cities.” Cities are thus integral components of local, regional, and global economies. When subjected to different kinds of disturbances, resilient cities continue to provide these valuable functions, though their form may change as a result. Subjected to a storm surge, they absorb energy but convert it into a reconfigured coastline; having become the destination for a particular group of refugees, they provide shelter and work, possibly through the repurposing of vacant buildings and neighborhoods; when global investors have shifted attention elsewhere, they cultivate local resources to fund local needs and initiatives, often through the generation of new businesses. Anti-fragile (Taleb 2014) and dynamic, resilient cities are both physically and culturally prepared to adapt to a range of uncertain futures. In so doing, they persist, while their brittle and inflexible cousins are gradually abandoned, dismantled, or destroyed by the same, or similar, events. The question that many planners are asking is whether we can create this kind of resilience in both new and redeveloping cities that are challenged by contemporary trends in population growth, coastal development, climate change, and other perverse local realities associated with globalization. I would argue that where it exists, resilience is tightly woven into the cultural and physical fabric of a city, but is not easily superimposed on top of it. Resilience, in my view, is the outcome of diffuse grass-roots, micro-scale activities that collectively and gradually create a culture and place that can change in response to diverse and unpredictable stimuli, so as to continue providing the services needed by its population. To design resilience, we need to think small and diffuse, not big and centralized. I offer three comparative examples. A new, regional storm surge barrier might protect certain coastal communities from certain types of storm surge; but its value pales in comparison to a city populated by individuals who, cognizant of the fact that they live in a flood plain, can easily move to higher ground temporarily when a flood is predicted. The latter requires an efficient means of diffusing information about imminent risks, a widely understood and multifaceted response plan, and an efficient transport network that can support relocation of different people in different directions at almost any time to a decentralized network of safe havens. For the second example, think Baltimore, Maryland. Tourists and multinational corporations may initially be attracted to a fancy downtown, but if residents of the surrounding neighborhoods are barely getting by, and suffer from high crime, poor schools, corruption, crumbling infrastructure and high drug traffic, how resilient will this city be, for example to economic shifts that raise unemployment, or media reports that begin to spoil the glossy public image and brand that the local elites had been attempting to disseminate of the city center? A resilient Baltimore needs widespread attention, not just a fancy waterfront. And finally, considering that each year the world wastes about 1/3 of the food it produces (FAO 2015) while global obesity, one of the leading causes of preventable depth, has doubled since 1980 (CDC 2015, WHO 2015), let’s consider resilience as it pertains to food choices. We can continue to subsidize industrial agriculture practices that, often located in increasingly drought prone areas, require massive application of pesticides and fertilizers, and generate extensive carbon emissions to transport highly processed agricultural commodities 1500-2500 miles (Worldwatch Institute 2015) before showing up, mysteriously, in your bodega in some highly processed form. Or we clear the way for the growing local and urban agricultural movement that enables urban dwellers to see more readily where their food comes from, and to choose to participate in its production, while creating new uses for post-industrial landscapes, new economic opportunities, and old-fashioned backyard learning. As the international development adage goes, the hungry man who is given a meal asks for another, while the one who knows how to fish feeds himself. If urban resilience arises from decentralized grass-roots choices and actions that allow cities to provide valuable functions and services to the various populations that live in, or are linked to them, we can measure it by interacting with urban people. Resilience planners need to seek to understand why we, the urban population, do what we do; they need to better understand what motivates us and what hinders us; they need to remove the barriers (often historical and/or imposed from afar) that prevent us from solving our own problems. Resilient cities will be as diverse in form and function as we are diverse as an urban populace. Resilience plans will morph and change as we learn and grow. Resilience solutions are local and diverse, not monolithic and standardized. Harris, CD and EL Ullman (1945). The Nature of Cities. The Annals of the American Academy of Political and Social Science. 242: 7-17. Jacobs, J (1970) The Economy of Cities. Vintage. 288 pp. Taleb, NN (2014) Antifragile: Things That Gain from Disorder. Random House. 544 pp. Luciana Nery is Deputy Chief Resilience Officer of Rio de Janeiro and wishes to incorporate the lessons learned at the Olympics for the resilience of the city. In theory, it is not difficult to measure the evolution of resilience in time: to the same shock, there must be less impact. This means that if a strong earthquake hits a city twice, the city is more resilient if by the second time it suffers less damage and fewer casualties. Or if the shock is an economic downturn, then the city is more resilient if the next recession is milder and its consequences are short-lived. A 40mm/hour rain in Rio de Janeiro usually means that landslides will happen in the mountain slopes, threatening entire communities and claiming many lives. Since 2010, 40mm/h is the threshold to evaluate the need to activate the early warning system in the high-risk areas. 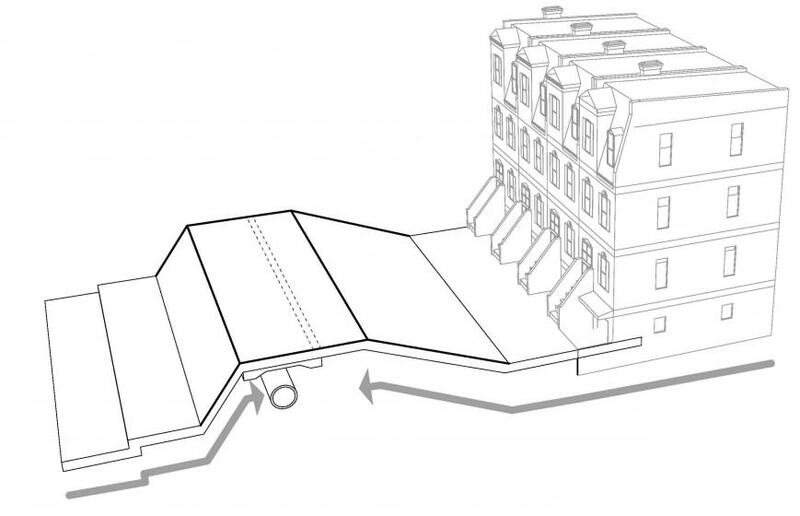 In the meantime, the city built extensive slope contention infrastructure, resettled families in high-risk areas and established frequent evacuation drills. A recent study conducted by GeoRio of all landslides related to extreme weather events between 2010-2013 concluded that the threshold to initiating action can be safely raised to 55mm/h. More importantly, in that same period, no life was lost due to landslides in the city. This means that Rio de Janeiro is verifiably more resilient to heavy rains. In this specific instance, that of rains and landslides in Rio, the scope is limited, the variables are well-known and the data are reliable. This is seldom the case in many other aspects of resilience. In the real world, how often can we establish parameters to determine cause and consequence? More than that, some consequences must be avoided entirely—and then being resilient is not allowing the shock to happen in the first place, like pandemics or terrorist attacks. In those cases, investments in prevention and the monitoring of trends is what fosters resilience, and then measuring the (non) consequences can feel substantial to policymakers, and yet seem diaphanous to the general population. Then perhaps resilience must be measured not solely ad hoc, in terms of measuring impacts and its consequences, but also contextually and at the community and individual level. To what extent is a city, community or person exposed to a certain vulnerability, be it natural or manmade? As the concept of resilience grows in importance for cities, so does the search for comprehensive and yet pragmatic indicators and measurement tools. The World Resource Institute, in partnership with the City of Rio, is developing a set of indicators for resilience. The work is in progress but we have already reached some conclusions. The poor are disproportionately affected by shocks and chronic stresses, and a high proportion of socially vulnerable people will certainly make a city more fragile to all kinds of shocks. 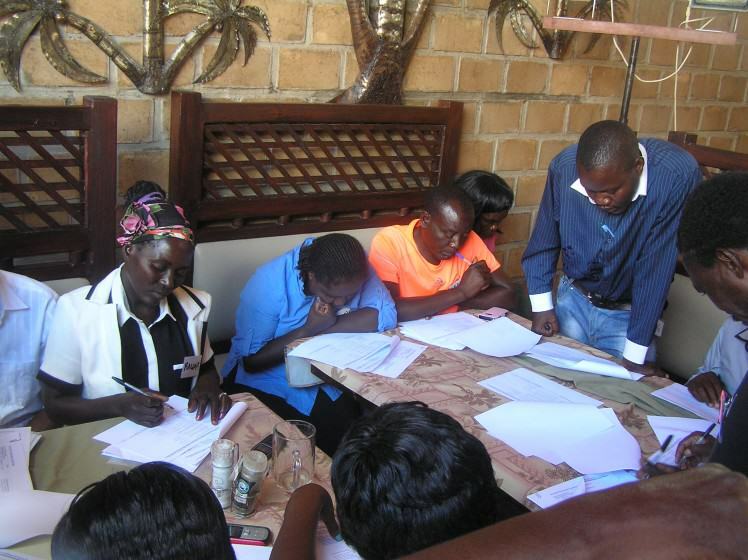 Measuring their resilience, thus, entails assessing their social vulnerability: educational level, employment status, access to basic services like sanitation, clean water, garbage collection, health, etc. Another conclusion is that measuring self-reliance and preparedness of the general population is essential, so that efforts for fostering a culture of prevention can be assessed. Self-reliance and preparedness also depend heavily on the social cohesion of a community—when it comes to safety and awareness, the individual and the community are virtually indistinguishable. It is, therefore, the job of resilience practitioners worldwide to engage people in finding how they feel, respond and act more resiliently. It is this self-reliance and preparedness of citizens that, in addition to public policies and city resources, can prepare a city to face not only its recurrent risks, but also the unexpected ones, the black swans. The efforts are ongoing. Cities and institutions around the world are working on resilience indicators. More than ever, cities are collaborating with each other. Big Data is more readily available. Indicators and units of measurement will be tested, improved upon and shared; then they will become widespread and continue to evolve. After all, it is not a simple task: if we are setting out to measure resilience in cities, we are also measuring our survival and prosperity. Let the challenge begin! Henk Ovink is Special Envoy for International Water Affairs, Kingdom of The Netherlands. Disasters are terrible. I always use the image of “I hate you Sandy” painted on a wall somewhere on the Jersey beach, to stress that whatever happens and how bold and big government and private sector can come in, it is still all about the human scale. Bridging the gap between public and private also means bridging the gap between the institutional world and the people, the communities and the informal world. Because there is not only a disconnect between politics and people, there is also a disconnect between professionals and people. Poor people live in poor places all over the world. They are hit hardest when disasters strike, fully dependent on others to get back on their feet. Some say resilience is all about the capacity to bounce back after a disaster. But I say that is not enough. Resilience is a progressive term, it is about bouncing back different and smarter, through collaboration, innovation and the best of science. In the Netherlands we have a long long tradition of managing risks and uncertainties and deliberately started to built our country in the Delta of the rivers Rhine, Meuse and Scheldt. A delta prosperous and vulnerable at the same time. Public private partnerships were key from the beginning. Nowadays we manage these risks and uncertainties in a cross governmental long term Delta approach, where public, business and knowledge sector join forces in a joined approach. This year’s WEF Report put the impact of Water Crises as #1 risk, at last we acknowledge as businesses, ngo’s, academia and governments that water is the #1 risk and also its number one opportunity! Water is the global connecting task. Two billion people will be devastated by 2050, four billion in 2080 if we continue with our current practices. Of all worldwide disasters 90% is water-related. Global urbanization gives us growth, prosperity, emancipation and development opportunities, but climate change, sea level rise and increasing impacts of these risks put a lot of pressure on our cities, societies and citizens, on our economy and ecology. If we don’t act the system will collapse and then we are the victims of our own failure and missed opportunity. Water is at the heart of this uncertain future, it is through water that we feel the impact of climate change the most. Water is essential for our economy, our social and cultural well being. Water quality defines our economic and societal prosperity and water risks—too much or too little—define our society’s vulnerability. Water is an urban matter, an asset if right, a severe risk if not. And while urbanization has this emancipatory capacity—women work and kids learn—it is the collective water issues that puts these urbanizing places at higher risk and thus stressing—again—the emancipatory curve. Water connects economy and ecology and on the urban regional scale we can adapt and mitigate and thus strengthen our cities and our communities world wide By collaborating across silos, bridge gaps and use new ways for public private partnerships to get to such an approach. The WEF’s Global Risks Perception Survey’s showcase over again that future risks (climate change, water crises, biodiversity loss and ecosystem collapse, extreme weather events, natural catastrophes, man made environmental catastrophes, etc) are increasing in frequency and impact. At the same time these risks show a clear and strong interdependency on a regional, most often urban scale. Although this increases the complexity of these risks and their impacts this is also the scale where we (mankind) can adapt to and mitigate these risks! This is where we can and must act. No negotiations towards agreements on paper, but collaboration in practice and ensure that that collaboration leads us to agreements. Negotiations never build projects, the experience helps to agree. 2. Better instruments: Benefit Cost Analysis, Monitoring and Evaluation instruments are critical but often are different, non-comparable nor cross applicable and lack the capacity to capture comprehensive long term integrated resilience approaches. We have to share all our global knowledge we built up over the years to ensure that worldwide there is a better common understanding on how transparency and accountability can be strengthened both in public as well private environments through the development of new and better models and instruments. 3. Programmatic long term: next to our short term project based assessments where it is fairly easy to calculate benefits and bring in the private sector, we need a better understanding on how to assess and evaluate and thus build trust and commonality on a long term, comprehensive, programmatic investment approach. 4. Innovation: we need new models to address innovation. The Rebuild by Design competition I developed and led for the former US Presidential Hurricane Sandy Rebuilding Task Force, created a sabbatical detour, on the edge of the institutional world, collaborating across all partners, design driven, focused on resilience in light of future risks. We delivered 41 opportunities with coalitions and ended with awarding 6 strikingly innovative proposals for resilience investments across the NY region. 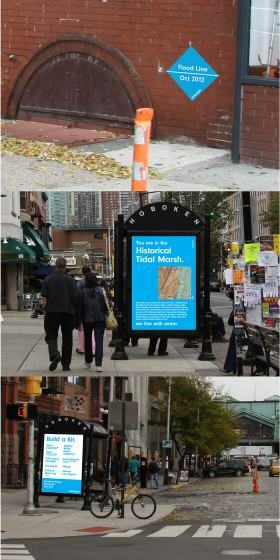 UNISDR just acknowledged the Hoboken proposal as Model for the World. How to incorporate lessons learned, for example the current Dutch Delta program agreed upon by our congress that addresses future risks for the next 100 years, with secured funding for the next 35 years. No time to waste. We have to start now, in a transparent and accountable way, use principles of collaboration for developing long term, comprehensive approaches to capture revenues and ensure upfront public and private investments. We need to use this testing as the inspiration, as the new standard, as the way to replicate for a better tomorrow and bring these learnings back into our institutional worlds, both public and private and by doing so really innovate and reform. This is really about capacity building not only within those vulnerable communities but as much within our institutions of governments, businesses and research institutes. The reform of the institutional world is key for resilience success. Right now no one in this world is ready, no one, no place, no system is fit for the future. We have to collaborate world wide to tackle these challenges together. This collaboration is different than any collaboration before. This is not about negotiating the best parts for ourselves, this is really about securing the world for generations to come. Not by fixing it, but by changing the culture. And with that changing our systems so they can become more resilient, more adaptive and empowered in embracing and dealing with complexity. 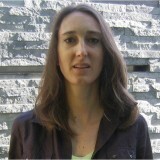 Elisabeth Peyroux is an urban geographer at the National Centre for Scientific Research (CNRS), based at the UMR Prodig in Paris. She works on urban development issues in Johannesburg. I engaged with the debates on resilience while doing research on urban planning in Johannesburg. In 2011 the Johannesburg 2040 Growth and Development Strategy (GDS) committed itself to provide “improved quality of life and development-driven resilience for all”, “a resilient, liveable, sustainable urban environment” and “an inclusive, job-intensive, resilient and competitive economy that harnesses the potential of citizens” (City of Johannesburg, 2011, p. 9). I think the context of South African cities’ transformative agenda provides an interesting starting point to reflect on the idea of measuring resilience. As opposed to the so-called conservative “bounce back” perspective, resilience entails a dynamic process set in motion by a transformative action whose aim is to promote a more “inclusive” development pathway: “Resilience is the capacity of a system to continually change and adapt, yet remain within critical thresholds – even when confronted with the unexpected” (City of Johannesburg 2011, p. 25). 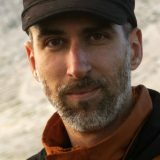 The GDS shows that some of the critiques made towards complex adaptive system related to resilience thinking can be partially overcome, at least discursively: by stressing human agency, by assigning social values to development goals, and addressing issues of inequalities and injustice. Writing from a political economy perspective I am critical towards the notion of resilience and its translation in policy making (in line with Davoudi, 2012; Joseph, 2013; Welsh, 2014). Measuring resilience in cities poses, to my eyes, overwhelming challenges. This undermines the very idea that it can be usefully mobilised in urban planning. Measuring resilience in cities means that we can identify it and provide an accurate characterisation and quantification of it (Carpenter et al. 2001). This also means that resilience can be monitored in such a way that it can inform policy-making. The first challenge for policy makers is to identify the factors that give rise to resilience in a complex environment: a highly diverse population, an heightened sense of uncertainty and unpredictability, the need to consider the intertwined effects of internal and external factors, the interdependencies between ecological and social systems, time scales and cross-scale dynamics. In addition, in a city as unequal as Johannesburg the challenge entails developing “a relational understanding of resilience” (Prior and Hagmann, 2013, p. 14) that can support a targeted allocation of funding in line with developmental goals. Second, measuring resilience implies measuring both the capacity of the system to achieve resilience (a process of capacity building) and the outcomes resulting from this capacity (a change of state of being). The difficulty, in addition to developing adequate quantitative and qualitative indicators, lies in assessing how these processes and outcomes are directly or indirectly linked in order to draw lessons on “what works” and “what doesn’t work”. Third, some indicators of change of state of being are observable and quantifiable: in Johannesburg an expanded Human Development Index that is closely associated to asset and protective factors linked to resilience is used to measure the improvement in the quality of life, wellbeing and development. Other factors connected with resilience, such as social cohesion and inclusion and social justice (“A society that is cohesive and inclusive can withstand change and extreme shocks (…)” (City of Johannesburg, 2011, p. 29), “Pursuing just distributions of benefits, to improve the adaptive and resilient capacities of vulnerable groups and the citizenry of Johannesburg as a whole, is central to resilience and to sustainability” (City of Johannesburg 2011, p. 32), are difficult to observe empirically and to quantify. Finally, measuring resilience should be considered both as a methodological and a political problem (Prior and Hagemann, 2013). Through the neoliberal rhetoric of responsabilization, self-sufficiency and self-sustainability resilience thinking serves as a way to justify the withdrawal of long term, permanent state support exposing the ambivalence of the concept of local developmental state in South Africa. By favouring the constant adaption of the subject to current situation over the resistance to the conditions of its suffering (Welsh, 2014) resilience thinking can eventually seem at odds with the Johannesburg social transformative agenda, as such approach forecloses the possibility for people to challenge the structural foundations of unequal power relationships that cause poverty, deprivation and inequality, the very sources of the so-called “lack of resilience” of the population. Carpenter , S., Walker, B., Anderies, J.M., Abel, N. (2001) From metaphor ro measurement: Resilience of what to What? Ecosystems 4: 765-781. City of Johannesburg (2011) Joburg 2040 GDS, October 2011. Davoudi, S. (2012) Resilience: A bridging concept or a dead end? Planning Theory and Practice 13 (2): 299-333. Joseph, J. (2013) Resilience as embedded neoliberalism: a governmentality approach. International Policies, Practices and Discourses 1 (1): 38-52. Prior, T., Hagmann, J. (2013) Measuring resilience: methodological and political challenges of a trend security concept, Journal of Risk Research, DOI:10.1080/13669877.2013.808686. Welsh, M. (2014) Resilience and responsibility: governing uncertainty in a complex world. The Geographical Journal 180 (1): 15-26. 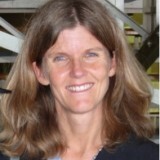 Catherine Sutherland is a lecturer in the School of Built Environment and Development Studies, University of KwaZulu-Natal. 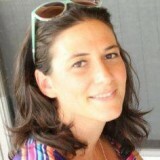 She is an urban geographer who focuses on urban sustainability and environmental governance. Resilience is a contested term, as its definition and transformative value depends on from whose perspective it is viewed. The emergence of resilience as a ‘new’ way of approaching the economic, social and environmental crises we face, particularly in light of climate risk, reminds me of other moments when new ways of thinking about environmental challenges rose to the fore. In the 1960s ‘limits to growth’ became the dominant discourse framing environmental politics. In the 1980s ‘ecological modernisation’ and ‘sustainable development’ emerged as dominant discourses. Within each era of new ideas, scientists focused on ways to measure how far we had travelled in meeting the principles and goals of each discourse, with their indicators showing progress in some areas and failure in others. Some of the measures were universal and general, while others revealed that the measurement of environmental sustainability needs to be context specific. Most of these measures were developed by scientists. The measurement of resilience concerns me as it appears that those developing measures for it have not learnt from, or engaged with, other ‘moments’ in the history of the environmental movement. One of the main questions that have been asked in the critical reflection of these approaches is from whose perspective sustainability/ecological modernisation/resilience are being measured and for what purpose. This is important as it raises the issue of who has the power to define and shape each discourse and whose interests are being served in defining and measuring the relations between society and the environment in this way. Is ‘resilience’ acting in the interests of the poor and vulnerable and in the interests of highly degraded environmental systems, or is it just another way for those in power to mask the real reasons for poverty, inequality and environmental destruction and to move away from the just transformations that are required to change the world and the power imbalances in it? Resilience is about adapting, coping and learning to live through shocks and risks—it is therefore about ‘managing the dangers’ not challenging or changing them. It is about making people resilient, which is important when disaster strikes, but in so doing, it undermines the social protests and social movements that are required to change the world, as it makes it possible for the status quo to remain. It makes ‘coping’ a way of life for those who are tasked with managing environmental challenges and those that live through them. It does not question nor address the politics or power relations in cities and hence it cannot be fully transformative. Another issue I have with measuring resilience is that much of this new discourse implies that people become resilient because of the policy and action of some outside agent and through the rationalities of government. It is the impact of these interventions that are measured. In other words, they were not resilient before. This notion needs to be strongly criticised as it does not recognise that the poor and vulnerable are continually being resilient, as that is how they live their lives. What needs to be measured is the entanglement of state policy and practice and the practices evident in the everyday lived worlds of ordinary people and how these together, through their relations, contribute to greater resilience. This is much harder to measure as these entanglements emerge in multiple ways along multiple paths at different scales. For me, the value of ‘resilience’ lies in the lessons learnt from it. This learning is achieved by tracking resilience along its multiple trajectories as it emerges in different places within different contexts. Resilience is present in so many different forms. 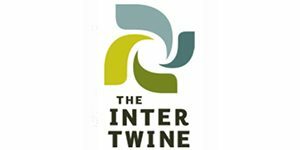 We need to start in local spaces, with local people, following ‘resilience’ and critically analysing it together so that it can reveal why and how people are having to be resilient and what this tells us about the power relations in the world between people and between people and the environment. And then we can begin to think about how we can change these relations, measure these transformative shifts and move towards a better world. 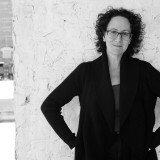 Claire Weisz, FAIA, is the founding principal of WXY, an architecture and planning firm based in NYC. Recently one of 10 Rebuild by Design finalists, her current work includes designing the new Rockaway Boardwalk post-Sandy. Imagine this scenario; you live in a dense urban community along a vulnerable coastline, a catastrophic event occurs with only 6 hours warning, but since a web of communication exists to locate and reposition people, critical assets and provide alternative places to live and work short term. Issues have been worked out so that the time of recovery is minimized to 24 hours and there has been no loss of life and livelihood. In this community individuals and everyone around them are constantly reminded through notations on the physical surfaces of the city, their environmental history and through this the dynamic nature of where they are standing. Through these simple set of graphic interfaces, that are constantly kept current by real time data from scientists, people are able to learn as they go through their daily lives their risk level in a very subconscious yet concrete way. In the event of a climate related extreme events and conditions, these citizens, when they get critical warnings, via their devices or through media, understand in a visceral way where they are and therefore what they need to do. Because of the level of individual awareness, government and businesses alike have had to agree on a system and plan in the case of sudden and extreme climate related events. Although change is difficult, likely the increase in public and environmental knowledge has resulted in increases cultural and social capital spread across income levels. New York City under Hurricane Sandy. Designing shared civic and communication spaces and systems by connecting individuals to larger urban common webs and linkages is also about aligning values. By designing viable shared systems through a transparent process a need will emerge to evaluate longer term investments with the greatest chance of social equity and least environmental loss. More people than ever before are challenged by lack of leverage and access to power structures and at the same time more vulnerable to living in a degraded environment. If insurance and funding mechanisms are tied to minimizing unintended negative effects and maximizing individual and neighborhood autonomy, projects like zero energy neighborhoods, district renewable energy, zero waste districts, pooled investments in regional storm protection projects, shared regional risk analysis tying all local projects together, become important to pilot and advance. Working this way the mechanisms of design and planning are the means to understand actual places, guiding policy and thus funding projects to reflect the way people behave both as individuals and in aggregate. Building soft and hard systems; from signage, to floating communities, new public transit and public spaces, to new places for habitat, wind turbines and water resource management, that help us adapt, model and test new ways of living and producing, are critical to a future of competing priorities and fluctuating risk levels. A resilient and adaptable response as described in this snapshot is only achievable by design. This means designers and scientist being at the table together. Without the will to design both the process and the implementation of a multi-layered meaningful and responsive system, there will be stop gap, insufficient and less resilient communities. Without scientifically driven and ecologically understood design goals, there will be investments in expensive solutions and systems that are difficult if not impossible to update, that don’t take into consideration the flux of daily existence, that fail under the stress of people’s constant changes in priorities. “What if?” the inevitability of the “internet of things” along with advances in the dialogue between scientists and designers could be catalytic in unexpected ways. Potentially what has started with foundation funding and private research initiatives might spawn new types of entities—public/ private partnerships—whose values demand that improving social, economic and environment conditions be aligned. These new ways of doing business and playing politics would avoid the zero sum game of choosing who benefits and who doesn’t by having changed where the goal posts are. Then the value of scientific data and metrics to track losses and gains across many variables and factors would be the engine to realize the resilient communities that we are currently unable to achieve. 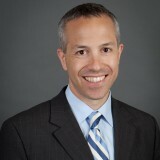 Daniel Zarrilli was appointed in March 2014 by Mayor Bill de Blasio as the Director of the Mayor’s Office of Recovery and Resiliency for the City of New York. In this position, he is leading the development and implementation of the City’s OneNYC resiliency program. Hurricane Sandy was the worst natural disaster to ever strike New York City, claiming 44 lives and causing over $19 billion in damages and lost economic activity. As we continue to recover from its effects, we have also recognized the need to prepare for a wide range of future risks, not just ‘the next Sandy,’ as we continue to build a stronger, more resilient city. In fact, just in the past fifteen years, New York City has faced a varied set of threats, including terrorist acts, an Ebola outbreak, hurricanes, an earthquake, a blackout, and a global economic downturn—all events that could challenge our ability to cope as a city and as an urban system. The only certainty is that the future is uncertain and the next threat won’t look like the last. That’s why we have recently taken stock of our existing challenges. Our population will grow to 9 million by 2040; our infrastructure is aging; inequality is increasing; and, of course, our risks from a changing climate and other threats are growing. With climate change in particular, Sandy certainly highlighted the city’s vulnerabilities, and those vulnerabilities are projected to get worse. According to the New York City Panel on Climate Change, sea levels are expected to rise 11 inches to 21 inches by the 2050s, and 22 to 50 inches by 2100. With this projected rise in sea levels, the city’s floodplain will continue to expand, creating more frequent and intense flooding. A similar Sandy-like event in 2050 could cause $90 billion in damage and lost economic activity—compared to Sandy’s $19 billion—due to the rise in sea levels alone. The good news is that the City is acting to address these challenges. In April, Mayor Bill de Blasio released One New York: The Plan for a Strong and Just City. The OneNYC action plan guides the City’s investments in four strategic themes of growth, equity, sustainability, and resiliency. For us, resiliency is not just a metaphor. But what does it mean? Our vision for resiliency is that our neighborhoods, economy, and public services will be ready to withstand and emerge stronger from the impacts of climate change and other 21st century threats. 1. Every neighborhood will be safer by strengthening community, social, and economic resiliency. This means we will improve neighborhoods by strengthening local organizations, expanding economic opportunities, and mitigating the effects of heat. 2. The city’s buildings will be upgraded against changing climate impacts, such as floods, wind, and heat waves. 3. Infrastructure systems will adapt to maintain continued services in the face of projected disruptions and impacts. 4. Our coastal defenses will be strengthened against flooding and sea level rise using a mixture of locally-tailored measures. How will we know if we’ve succeeded? Measuring resiliency is no easy task. We intend to monitor several key performance indicators over time, including the Social Vulnerability Index for neighborhoods across the city, and our average annual economic losses resulting from climate-related events. These are the highest level indicators toward our goal of eliminating disaster-related long-term displacement of New Yorkers from homes by 2050. By continuing to implement our full resiliency program – its physical, social, and economic measures – New York City is committed to achieving this goal, enabling us to fulfill our vision to withstand and emerge stronger from the impacts of climate change and other 21st century threats. As urban systems are social systems, projects that strengthen connectivity and assist citizens to understand how to access space or knowledge enhances resilience of communities. Is it possible to measure relationship and connectivity through resulting actions? Of the varied dimensions that comprise resilience, we must not ignore a basic functional level…personal financial adaptation. No city in the United States, nor in any of the developed economic powers, is truly “resilient” unless the population is given the monetary tools to adapt to changing global conditions, trends and threats. Much of the focus of governmental planners with regard to an altering climate has been to strengthen the “built environment.” This almost singular focus is myopic. We lose our shared social fabric if national and state governments fail to enrich our economy with 21st Century financial tools to deal with sea level rise specifically and a warmer greenhouse atmosphere generally. For example, Washington D.C., can foster personal economic resilience in the form of new tax policies, mortgage modification programs for those impacted by rising seas and tax free adaptation savings accounts which are focused on strengthening the fiscal mesh of our communities. Cities cannot be genuinely resilient without policies and programs designed to enhance personal adaptation. I’m speaking of the “micro” level. Once enacted (and tested in the Courts) responsible and constructive functional tools can bring resilience down from the 10,000 foot level into the grasp of the individual. Bottom line: Governments can be incubators of stronger and more flexible metropolitan areas in these challenged times by studying and acting upon the individual’s desire to be a financial partner in our shared emergency of climate change. Taking personal responsibility means being able to utilize new, innovative financial and economic tools, created by political leaders and the financial world, to make us stronger. Let’s broaden our view to grasp innovative pecuniary opportunities to be financially resilient in the coming decades. I too am pleasantly surprised by the number of contributors here who agree that resilience is a process and highly context specific. Lorenzo Chelleri, in his comment above, rightly points out that delivering resilience which is not oriented towards a particular outcome but focussed on building the capability of people to influence outcomes at multiple scales will require a major rethink of the processes by which we plan, develop and strategize for our cities. More so because our current models of development require measurement, operationalization and sector-based strategies, creating silos and diminishing opportunities for collaboration and innovation. What would we say to cities framing generic resilience strategies? First, I would question whether cities really need a resilience strategy that sits outside of other initiatives. Second – as Cezar Busatto, Henk Ovink and others point out – resilience requires a culture of participation and a process that allows innovation and experimentation across sectoral barriers. Hence, perhaps cities could start by considering whether their sectoral strategies meet the needs of city-regions as dynamic interrelated social-ecological systems. Another area of intervention could be to understand where (and how) existing development and planning processes exclude opportunities to engage with diverse stakeholders and diverse scales, potentially missing out on valuable knowledge and new ideas. One has to acknowledge that formal processes of public engagement are often limited by the need to make decisions and initiate action. This makes it even more important that knowledge sharing, collaboration and innovation are culturally embedded and an ongoing process rather than procedural initiatives. I agree with Mr.Elmqvist ‘s point regarding the view that too much efficiency in a system might lead to overdependence and non-redundancy of said system. Flexibility is one tenet of resilience; whereas a highly efficient system, focused on outputs, might also mean lack of options and a spectactular failure. There’s an example in the mountains surrounding Rio de Janeiro, prone to landslides. Residents, whether rich or poor, made their own rain gauges, and they knew that after a certain level they’d better evacuate their homes. Everybody knew a neighbor’s home that was perfectly safe and they’d go there. Cue to big government intervention. Professional rain gauges were installed, along with a network of sirens. Feeling that now government was overlooking this, in a single decade the residents lots the habit of making and checking their own DYI rain gauges. More than than, people who moved in never acquired that habit either, and did not know to what extent heavy rains could be damaging. In short, the population relinquished this knowledge and responsibility fully to the government. Then, in 2011, a huge storm came; few sirens worked for lack of connectivity, and what followed was Brazil’s worst natural disaster in the 20th century, with more than 1,000 people dead. There is no doubt that the homemade rain gauges, if they existed then, could have been used to save many lives. Quick comment to John’s point “Resilience requires a flow of resources to heal damage due to a disaster, but resources won’t flow unless information about the need exists.” I’d suggest that ‘disaster response’ requires the resource flows John; a resilient system (to whatever) actually requires minimal surge flows of resources, as the damages are (ideally) minimized, and continuity measures protect the flow mechanisms. These measures can be integrated at any scale over time…and across any organizational systems…over time. Dear Isabelle, thanks for your comment and rising the issue of critical resilience studies. However, I have been positively surprised that not only me, but many other contributions of this roundtable, from the academia, addressed the multifaceted aspects of resilience thinking leading to potential maladaptations or unsustainable outcomes. Even more, also cities delagates addressed critical perspectives of resilience, proposing indeed local and social capital building strategies. Indeed, among the many brilliant contributions I’d say that the most of us agreed that: i) measuring only 1 (or a set of) specific resilience dimension really does not apply, ii) the link with urban sustainability (the long term – resilience) is key in “driving” resilience building and that iii) people and places really are the ground for effective, holistic and long term resilience building in cities. The questions raised by Lorenzo Chelleri are absolutely key in our understanding of the socio-spatial inequities that resilience planning could be overlooking or exacerbating. In many cities in the global North or South, resilience planning seems to be part of a “revanchist city” agenda and an empty signifier, similarly to what “sustainability” or “green” have represented during the past decade. As cities brand or rebrand themselves as “resilient,” they can hide many problematic agendas behind such a slogan, especially in the context of climate change/climate adaptation. Land use plans that propose new green infrastructure to prevent urban growth in at-risk areas might directly or indirectly displace lower-income residents and while leaving upper-class neighborhoods untouched. The unequal enforcement of zoning regulations is also increasingly revealing that protecting the city against extreme weather events might actually legitimate unsafe/unsustainable patterns of growth and development together with creating new forms of social-spatial inequity. Processes of expanding infrastructure into central business districts (CBIs) rely on the unequal enforcement of land use planning regulations. In other words, resilience interventions can become a privileged and private good and create negative externalities , resulting in maladaptive and exclusionary outcomes. Such trends call for new research on critical urban adaptation planning and critical resilience studies. A group of foresters are walking through the dense undergrowth when they reach a clearing where a mighty oak has been uprooted by the wind. Some of them stop to study why that oak fell – the wind speed, the root system, perhaps the soil and so on. Some of them go on to the next clearing where a pine has been struck by lightning, and died and fallen. Again, some of them stop to study why the pine fell. Others go on to another clearing and begin to study how an elm attacked by disease has fallen. While each studies their downed tree in minute detail, all of them bemoan the fact that there are really too few downed trees of the same type that have fallen for the same reason to be able to obtain a general knowledge of why oaks or pines or elms fall due to wind, or lightning or disease. But they are standing in the midst of a forest in which the trees are each bending to the wind and the other elements and then straightening when the wind or the rain dies down. And the foresters are really most interested in what keeps the trees standing straight and tall, not what makes them fall. So it should be with community recovery and resilience. Resilience does not arise from demonstrated weakness but rather from the exertion of strength. Thus, we need to know and understand the strengths of each community, how those strengths are exerted, and how we can nurture those strengths so that they become even stronger. We must look to those still standing, not those who have been beaten down by the storm. Communities are held together by connections – personal connections. In general, those connections are the sinews of the city and what enable it to be resilient. Resilience requires a flow of resources to heal damage due to a disaster, but resources won’t flow unless information about the need exists. Thus, those parts of the community which are well-connected are likely to be able to rebound from almost any shock. However, those parts of the community which are poorly connected – isolated – are less able to rebound; resources won’t flow unless messages have a path to go to the owners of the resources. And because of physical interconnectedness, that may mean that if unconnected parts are directly attacked, the rest of the community will take much longer to recover than from an “attack” on a connected part (see http://www.resilientus.org/is-it-resilience-or-resilience-to-___/ for further discussion). As an example, consider a disease that starts in a poor part of town; little will be done until those better connected are infected. Or less theoretical – an organized effort to combat AIDS was not initiated as soon as it should have been because of the relative isolation of the gay subculture in many cities. Yet many of these same cities have been able to rapidly recover from physical assaults by Mother Nature. I’m not sure if it is specifically related to retail areas, but I was just informed that one of our colleagues has plans to pilot the indicators described in my entry above in urban areas in the near future. I don’t have the details yet, but please keep tabs on the project if you are interested. I’m not sure I quite agree with that assessment. My understanding is that a system can be perhaps “resistant” or “responsive” to certain kinds of shocks, but the whole point of “resilience” is that it is a wider concept taking in its overall ability to continue functioning in the face of any and all shocks and forces acting on the system. Of course measuring resistance to specific disturbances is much (or maybe not so much) easier than assessing overall resilience, but it is exactly the holistic nature of resilience that makes measuring it, or trying to, worthwhile. It may be difficult or even impossible to measure perfectly, but I wouldn’t say that means we have to give up the project and resign ourselves to measuring only narrower aspects that are easier to measure. The old one about the man searching for his car keys under the streetlamp comes to mind. I’ve been involved in a research project of that thematic and intend to continue research. Is there any website where I can follow the updates? Yes, we are, but only just starting. There are some important aspects of this multi-faceted question that weren’t really addressed. • Cities aren’t “resilient” – they’re “resilient to ___.” For example, a city might be quite resilient to a natural disaster, but torn apart by social disorder, or unable to recover from a recession or a pandemic. • Different parts of the city will be more or less resilient (to _____) than others. The recovery of each system in a city from a given shock will have its own rhythms – how do you measure a symphony? • Resilience should only be measured for some purpose. But different purposes – or different users of the measurement (“measurement” in the broadest sense, e.g., including Lance G’s assessment) – almost inevitably will lead to different measures. Some academics will want to measure resilience so that they can compare communities nationally or globally (Personally, I find this kind of activity to be something like a self-licking ice cream cone!). Community leaders who control purse strings will want to prioritize their investments based on cost, impact and ROI. After those investments are made, those same leaders will want to measure progress. All likely to have different measures. In short, the question needs focus – measurement of what, by whom, for what purpose? This blog is extremely timely as we (the international community) heads towards the adoption of the SDGs, the Paris climate summit later this year, and the World Humanitarian Summit and the Habitat III conference on sustainable urban development, taking place in 2016. All discussions leading up to these landmark agreements are considering how to measure resilience and, increasingly, how to establish measurements in an urban context. The Medellin Collaboration on Urban Resilience, launched during the World Urban Forum in Medellin, Colombia in April 2014 and chaired by UN-Habitat, has been working on developing tools and methodologies to help cities around the world build their resilience, be it to climate change, socio-economic threats, or other ‘unknown’ hazards. We’d be happy to share more information on the progress of this initiative. Essentially we found that a city’s level of economic integration is inversely related to how the city fared in the recent global recession – highly integrated, complex cities were more negatively affected. Not mentioned in the paper is the fact that we used the same methodology in an attempt to validate some leading urban resilience metrics and found that they largely predict the opposite of what they intend (or claim). The cities they calculate to be the most resilient were generally the ones that suffered most during a global economic shock. The moral is that it is very easy to create metrics. But if they are not validated then they should be greeted with a healthy level of skepticism. As some people intimate, the question of how to measure resilience is the wrong starting point as it assumes some general or universal set of metrics or instruments (an external or God’s eye view) when resilience is generally understood to be a fluid relational awareness of context. The logical first step would be a discussion of what it might mean to generate metrics of shifting and unpredictable interactions and relations, how this might work and whether alternative methodologies and epistemological assumptions might be necessary. Here, some of the discussions of Big Data highlight what is at stake, in so far as they illustrate attempts to drill down to the specific context, imagine the possibility of real time feedback responses and do not necessarily assume any causal or linear relations which can then be extrapolated through time and space. Is there anyone trying to develop a set of indicators to measure resilience uf urban retail areas?